Golly this is wizard! Top-hole! Super duper. 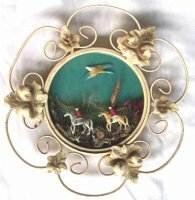 A glorious plastic hunting scene set in a wrought iron frame. Mysteriously the flying goose is as large as the horses…. A fact we can only attribute to artistic licence. And don’t ever let us hear you say that Cybergrot does not have the most amazing stock…..